"Filled with precise details of Albany’s vanished life, narrated in a prose both salty and exact. 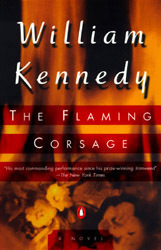 . ."
Kirkus Review offered this about The Flaming Corsage: “This latest installment in Kennedy’s ambitious Albany Cycle returns to, and deepens, many of the themes central to the series: the wayward nature of the human heart, the manner in which grief, regret, and enduring need shape and often remake family life, the way in which art, at its best, can clarify and transform life’s losses and pain … At its center is yet another vibrant, tragic couple: Edward Daugherty, a brilliant playwright, and his equally headstrong, melancholy wife, Katrina. Surrounding them is a cast of other distinct and startling figures: Francis Phelan, Katrina’s lover and a hero of Albany’s working-class Irish community; the talented, self-destructive journalist Thomas Maginn; and Melissa Spencer, a gifted, conscienceless actress who becomes Daugherty’s lover and sets in motion a murder/suicide that comes close to destroying Daugherty. The Flaming Corsage was published in France, Spain and Sweden.